Copperfield Equine Therapy and Rehabilitation Centre offers a range of newly built facilities with qualified people, to provide first class care and attention to your horses and beautiful peaceful surroundings with stables available for 15 horses. Sand arena for lunging, build up remedial work and flat work. A two furlong sand gallop fully fenced with Equisafe fencing for steady build up work, post injury and pre-training (see photo on right). 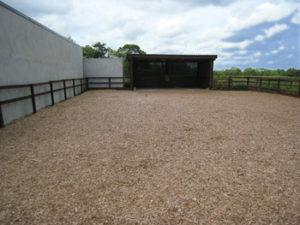 The centre is the ideal location for a convalescing horse. After a surgical procedure by our veterinary team, the horse can convalesce in the optimum environment for complete recovery. 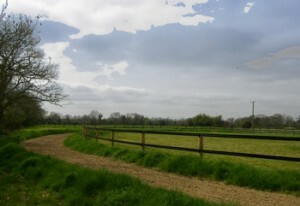 Our turn out paddocks are safe, fully post and rail fenced with trees surrounding for shelter. We use seaweed fertilizers. All our grasslands are natural, kept to extremely high standards (see photo below).